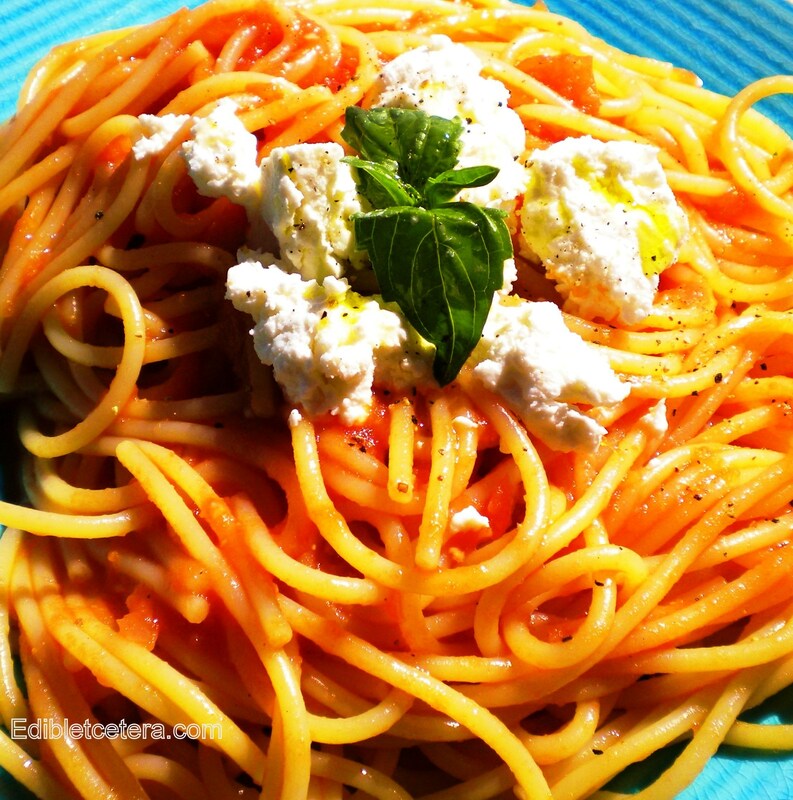 This is an outstandingly delicious sauce for pasta or any recipe that calls for tomato sauce. The slow oven roasting really concentrates the tomato flavor and the addition of honey creates a perfectly balanced finish. You can increase the garlic or chili to taste but I think the recipe below is just right. Serve it on its own with capellini or spaghetti; with grated parmigiano reggiano, percorino romano or fresh mild goat cheese (montrachet) and/or finely shredded fresh basil leaves. It also works wonderfully with lobster, shrimp or squid for pasta, or as a sauce for eggplant (aubergine) parmigiano. It’s very easy to make and freezes beautifully so you can make a large batch at once. Prep time is a couple of minutes; cooking time is approx 2 hrs followed by some time using a sieve. You’ll need a processor and a Mouli food mill or fine sieve. 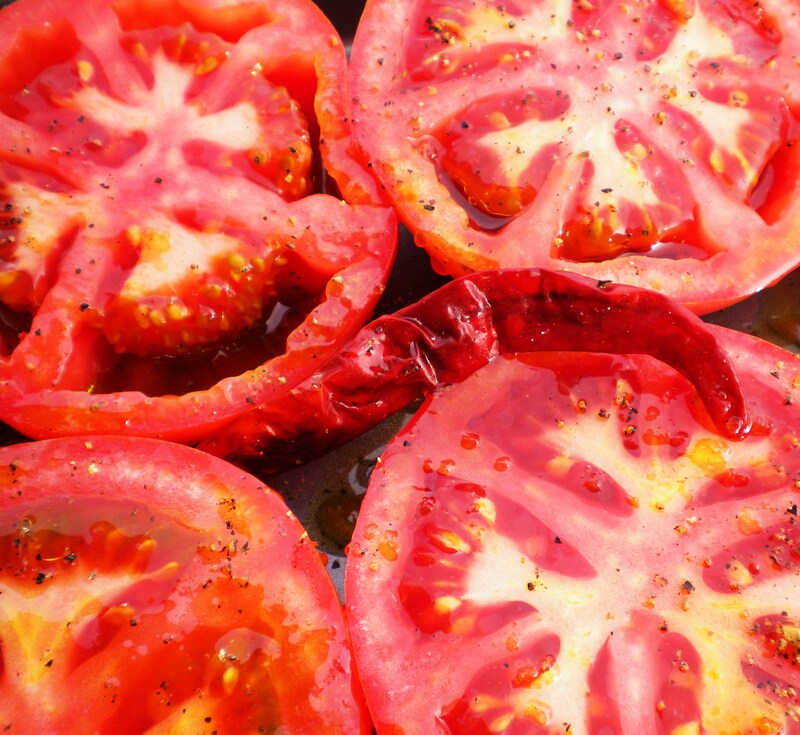 Halve the tomatoes around their ‘equator’ and place cut side up in a single layer in a shallow roasting pan. Stuff the whole red chili somewhere in the middle. Drizzle with the olive oil and honey, season with salt and pepper and roast for one hour. After the first hour, tuck the peeled shallots and unpeeled garlic in amongst the tomatoes and baste with the accumulated juices. Put back in the oven for one more hour. Remove from the oven and allow it to cool a bit. Squeeze the garlic cloves out of their skin and put in the processor with the shallots. Don’t do any processing just yet. If you’re lucky enough to have a Mouli food mill, process the tomatoes to remove the seeds and skin; otherwise manually push through a sieve into a bowl. 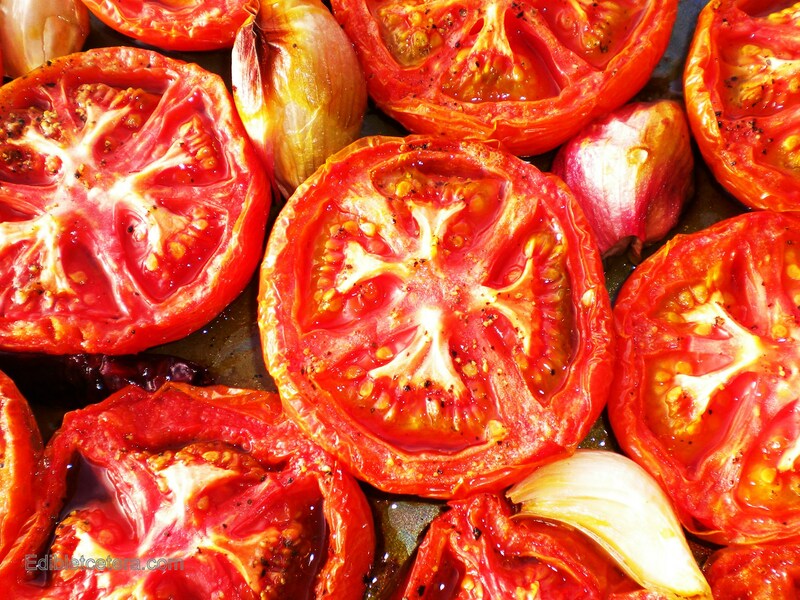 All of the wonderful roasting juices in the pan should be scraped out and added to the shallots and garlic in the processor, along with the sieved tomatoes… process and adjust salt and pepper to taste. That’s it. Tomatoes can be purchased ahead and allowed to ripen at room temp. I bought a tray of beefsteak tomatoes a week ago in Costco and they weren’t quite ripe. They sat on my kitchen counter and now they’re perfect. Tomatoes will never ripen in the fridge as it halts the production of ethylene gas which is given off by the tomato and is a necessary part of the ripening process. You can use a fresh red chili or a dried one depending on what’s available. I don’t know the names of all the varieties of chilies but I do know that the tiny pointy red ones from Thailand are eye-wateringly hot so use your judgment. The addition of chili doesn’t create a chili tomato sauce; its purpose is to add a certain indefinable something to the end result. Don’t over-drain the pasta – throw it from the pan into a strainer then back into the cooking pan. Add the sauce and warm through. Some pasta cooking water will help distribute this or any other pasta sauce. If you’re cooking pasta for a cold dish you’ll need to rinse the pasta well in cold water then drain thoroughly. Did what you said on the email. Hope I did it correctly. This sounds so good …now I want Pasta for lunch!